Just a teaspoon of road salt pollutes 5 gallons of water — forever. And each winter, Minnesota dumps some 730 million pounds of salt on roadways. That's probably far more salt than we need to keep our roads safe. Once snow melts, salt flows into lakes and streams. Once salt is in a body of water, it's nearly impossible to remove. In fact, the only feasible way to clean up salt-contaminated water is through reverse osmosis, which remains too expensive to implement on a large scale. Chloride — the mineral in salt that contaminates waters — is toxic to fish, other aquatic life and birds. It can hurt pets, too. For example, dogs might ingest chloride from melted snow, or it can irritate their paws. And it can become a problem for groundwater. 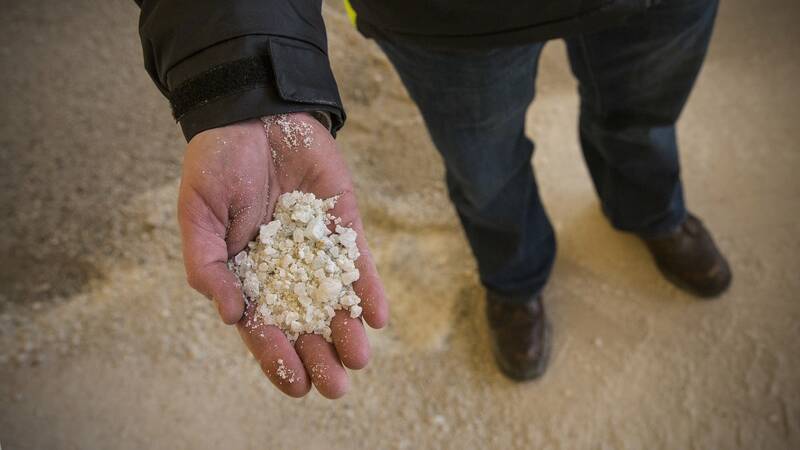 Take the case of Madison, Wis., where chloride pollution is making drinking water have a salty taste. Corrosion from salt does a number on our infrastructure. According to a widely cited estimate from Ali Akbar Sohanghpurwala, an expert in the field of corrosion of metals in concrete, one ton of road salt does about $1,500 worth of corrosion damage to bridges, vehicles and environment. And keep in mind we use more than 300,000 tons of salt each year just in the metro area alone. The Minnesota Department of Transportation is responsible for 12,000 miles of road in the state, so MnDOT snowplow operators get a lot of training on proper salt application. Best practices for road salting include using a mixture of about 70 percent water and 30 percent salt, and closely monitoring where you apply salt. The Minnesota Pollution Control Agency has launched a chloride management plan across the metro area. The plan focuses on what the MPCA calls smart salting, which is using the minimum amount necessary. The MPCA has an online tool for calculating how well different outfits are curbing their salt use, and it keeps a log of snow removal services certified and trained on smart salting. Cheese brine, beet juice and sand are all effective deicers in use in some places. However, they all have negative impacts on the environment — from contributing to excess sediment in water bodies to decreasing oxygen levels in lakes. One safe alternative: snow fences, or any barriers that keep snow from blowing on roadways. MnDOT has a project to increase the number of snow fences by collaborating with landowners to leave standing corn rows up to block the snow. New technologies show promise for safer, salt-free roadways. One option is using nanotechnology to coat roads so ice can't build up. Solar roads are also a possibility for both safe roads and clean energy generation. Some places in Europe are installing permeable pavement that doesn't need to be de-iced. However, it's safe to say these are all a long way from widespread use. So, in the meantime ... here's one last section. Remember where you live — this is Minnesota, and we can't expect dry roads all the time. So when the road conditions aren't perfect (i.e. most of winter), slow down. We'd also do well to become better friends with our snow shovels. Shoveling during and after snowstorms is the best way to keep driveways and sidewalks clear. Remember: The salt bag in your garage probably won't do anything but pollute if temps are under 15 degrees. This is the first in an occasional series of articles on road salt's effects on the environment as part of The Water Main, our new initiative that aims to bring people together, move conversations forward and create meaningful connections that help sustain clean, abundant water for all.